Antimicrobial, cooling and reviving. 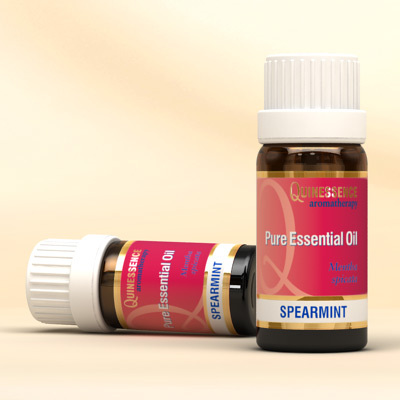 Spearmint Essential Oil shares some of the therapeutic properties of peppermint, and has other properties too. It has the additional benefit of containing less menthol which gives it a softer, warmer, sweet minty fragrance that some people prefer. Distilled from the leaves of the herb, this oil is very clearing, making it a good inhalant oil that is particularly good for reviving mental fatigue and improving focus without being over-stimulating. In massage blends the cooling, anti-spasmodic and analgesic effects of Spearmint Essential Oil can be used to soothe digestive problems such as nausea, flatulence, constipation and diarrhoea, or to ease aching muscles and joints after sports or a hard day. Inhaled from a tissue it can be used clear sinuses and catarrh, as well as easing head tension and dispelling negative emotions. The antibacterial and antifungal properties of Spearmint Essential Oil make it useful for treating dandruff and an itchy scalp, where it cools and soothes as well as stimulating the follicles, encouraging healthy hair growth. Spearmint also makes an effective and refreshing antibacterial mouth wash.